I’ve written about the gardens I used to plant and what I’ve learned through the many seasons and plantings. Let’s consider that God, too, has a garden, a spiritual field—and what our part is in that. 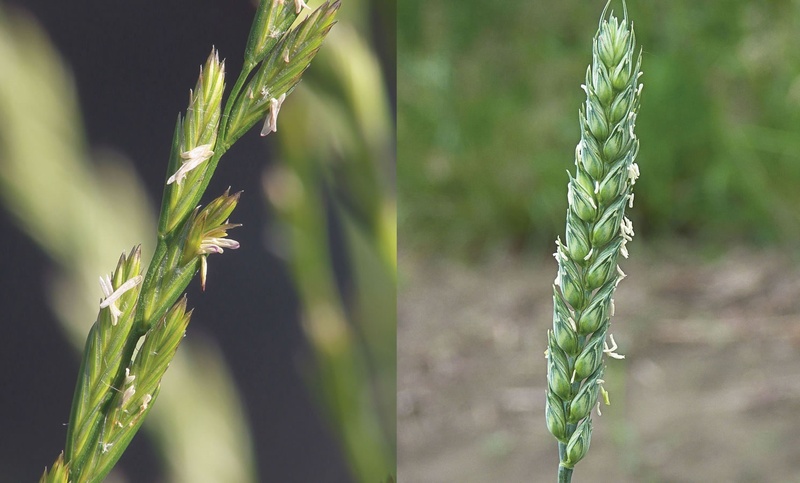 Only near the time for harvest can the fruiting head of darnel, left, be easily distinguished from the fruiting head of wheat, right. Before this stage the plants look almost identical. To the church congregation at Corinth the apostle Paul wrote, “You are God’s field, you are God’s building” (1 Corinthians 3:9 1 Corinthians 3:9For we are laborers together with God: you are God’s husbandry, you are God’s building. American King James Version×). Throughout this passage Paul makes it very clear that though he or another minister may have sown seed or tended and watered, it was God who gave the increase. God controls His field and what it produces for harvest (1 Corinthians 3:5-9 1 Corinthians 3:5-9 5 Who then is Paul, and who is Apollos, but ministers by whom you believed, even as the Lord gave to every man? 6 I have planted, Apollos watered; but God gave the increase. 7 So then neither is he that plants any thing, neither he that waters; but God that gives the increase. 8 Now he that plants and he that waters are one: and every man shall receive his own reward according to his own labor. 9 For we are laborers together with God: you are God’s husbandry, you are God’s building. This is both comforting and encouraging. Let me tell you why. While growing next to wheat, tares cannot be distinguished from the real wheat. It is not until near the time of harvest that you can discern which of the two is the real item. I’ve been a minister of the gospel for more than 40 years. I’ve pastored the people of God and taught them about the Kingdom. I’ve given thousands of sermons, driven countless thousands of miles to minister. I’ve baptized repentant believers into the Body of Christ, blessed countless children, anointed the sick and buried the faithful. Today I serve a wider audience through a ministry rooted in several forms of media, including this printed page. This calling has brought me into contact with all kinds of people and personalities. Though they have had many backgrounds and motives and problems in life, one thing brought us together. Our paths crossed on the field called the Church of God. It was in this venue that we talked, walked and experienced the grace of God’s guiding hand. In 42 years I still believe and teach what I did from the first day in this field, though refined considerably as I’ve learned and come to understand more. Sadly, some of those I’ve known no longer hold to the faith. As we saw in the parable of the sower and the seed, some allow the seed of the gospel to be choked out by the cares of life and the persecution of the world. Some with whom I once worked fall into this category. With most, I never foresaw that they would fall by the wayside, nor did they. We appeared the same to each other. We professed the same goals and beliefs. My work in Christ’s ministry has taught me another lesson. It is that even though we are in the fellowship of the same church, it may be for different reasons. The parable of the wheat and the tares adds another dimension to our understanding of seed sown in a field. “Another parable He put forth to them, saying: ‘The kingdom of heaven is like a man who sowed good seed in his field; but while men slept, his enemy came and sowed tares among the wheat and went his way. But when the grain had sprouted and produced a crop, then the tares also appeared. “‘But he said, “No, lest while you gather up the tares you also uproot the wheat with them. Let both grow together until the harvest, and at the time of harvest I will say to the reapers, ‘First gather together the tares and bind them in bundles to burn them, but gather the wheat into my barn’”’” (Matthew 13:24-30 Matthew 13:24-30 24 Another parable put he forth to them, saying, The kingdom of heaven is likened to a man which sowed good seed in his field: 25 But while men slept, his enemy came and sowed tares among the wheat, and went his way. 26 But when the blade was sprung up, and brought forth fruit, then appeared the tares also. 27 So the servants of the householder came and said to him, Sir, did not you sow good seed in your field? from where then has it tares? 28 He said to them, An enemy has done this. The servants said to him, Will you then that we go and gather them up? 29 But he said, No; lest while you gather up the tares, you root up also the wheat with them. 30 Let both grow together until the harvest: and in the time of harvest I will say to the reapers, Gather you together first the tares, and bind them in bundles to burn them: but gather the wheat into my barn. This parable is similar to the previous one only in that we have the sowing of seed. But that is where the similarity ends. Every other element holds a different meaning and takes us to a sobering conclusion about God’s field and those who are in it. A tare is a plant that commonly grows in fields of grain. And although it looks similar to an edible grain, it isn’t suitable for food. In fact, many feel the specific tare, or weed, referred to in this parable is the darnel, a poisonous weed that is very similar in appearance to wheat. While growing next to the stalk of wheat, darnel cannot be distinguished from the real wheat. It is not until near the time of harvest, when the wheat comes into ear or sprouts its fruit, that you can discern which of the two is the real item. “He who sows the good seed is the Son of Man. The field is the world, the good seeds are the sons of the kingdom, but the tares are the sons of the wicked one. The enemy who sowed them is the devil, the harvest is the end of the age, and the reapers are the angels. Therefore as the tares are gathered and burned in the fire, so it will be at the end of this age. “The Son of Man will send out His angels, and they will gather out of His kingdom all things that offend, and those who practice lawlessness, and will cast them into the furnace of fire. There will be wailing and gnashing of teeth. Then the righteous will shine forth as the sun in the kingdom of their Father. He who has ears to hear, let him hear!” (Matthew 13:37-43 Matthew 13:37-43 37 He answered and said to them, He that sows the good seed is the Son of man; 38 The field is the world; the good seed are the children of the kingdom; but the tares are the children of the wicked one; 39 The enemy that sowed them is the devil; the harvest is the end of the world; and the reapers are the angels. 40 As therefore the tares are gathered and burned in the fire; so shall it be in the end of this world. 41 The Son of man shall send forth his angels, and they shall gather out of his kingdom all things that offend, and them which do iniquity; 42 And shall cast them into a furnace of fire: there shall be wailing and gnashing of teeth. 43 Then shall the righteous shine forth as the sun in the kingdom of their Father. Who has ears to hear, let him hear. God has a field, defined here as the entire world. There is a divine meaning and purpose being worked out here. God is guiding history and mankind to an end that will fulfill His purpose. This parable is showing two different works being done in the world. And it provides understanding as to why there is evil. God plants good seed that becomes His children of the Kingdom. Satan, the wicked one, plants those who are his offspring. Because the tares and wheat look alike, it’s virtually impossible to determine by sight which is which. That is why God tells His servants to let them both grow to harvest when the difference will become apparent. Of course, “The Lord knows who are His” (2 Timothy 2:19 2 Timothy 2:19Nevertheless the foundation of God stands sure, having this seal, The Lord knows them that are his. And, Let every one that names the name of Christ depart from iniquity. American King James Version×). Satan influences by mood and attitude, and until we understand this and actively resist his evil spirit at work, we can unwittingly be his agents. Satan is the god of this age and keeps everyone deceived (2 Corinthians 4:4 2 Corinthians 4:4In whom the god of this world has blinded the minds of them which believe not, lest the light of the glorious gospel of Christ, who is the image of God, should shine to them. American King James Version×). And he can infiltrate the closest quarters of God’s people. Jesus’ words to this effect should serve as a warning. Here is a lesson I’ve learned as a pastor. Be patient with those you work with. Treat people with kindness, fairness and gentleness. God, who knows the heart—something I could not always discern—expects us to do this. One of the key thoughts in this parable is the owner telling his servants to not go through the field cutting out those they thought were tares. That is a pretty dangerous action. I worked with many people who expressed interest in God and a desire to live righteously. You learn to give them the benefit of the doubt. When they sin, it provides the opportunity to help them get back on their feet spiritually. People may at times act like a tare but be a son of the Kingdom. And people may act like a son of the Kingdom but be a tare. I couldn’t always tell. One of the lessons I took from this parable is to let God do the work of discerning who are His and who are not. Not only was it not my role, but I didn’t have all the tools for the job. A worker in God’s field has to adopt a position of vigilant toleration that watches like a shepherd over God’s people and teaches sound doctrine from the Bible along with gentle oversight. Treating people fairly and kindly always had good results. I might have let some problems go longer than I should have. But I thought it best to maintain a vigilant position, taking action when it was clear that some people had wrong motives and needed to be separated from the other members. The apostle Paul advised us to be patient. If the servants of the field owner had rampaged through the fields tearing up the good wheat along with the tares, what kind of mess would have been created? Good crops would have been prevented from coming to maturity and bearing fruit. So it is with working in God’s spiritual field and tending His Church. It is possible to harm, even destroy, the good in any effort to weed out the tares. God says to let them grow together until the harvest, the end of the age and the coming of Jesus Christ. Then He will make a distinction as only He can. Christ says that any who offend and practice lawlessness will be gathered and cast into the furnace of fire. Judgment is a difficult and hard time. But that is one of the lessons here. There is a time of judgment determined on the world. Those who are agents of Satan, engaging in deliberate acts of evil, will face judgment. The modern world doesn’t like to hear a word like judgment. Judgment implies that there are standards, laws and absolutes—both morally and ethically. But God says there is a coming time of judgment that will deal with lawlessness and unrighteousness. The key is that it is God’s judgment, not man’s. That is a wonderful and comforting truth, because God judges in perfect righteousness and in His time. We need to take God and His working very seriously. I don’t want to be a tare, someone who impersonates the real thing. How about you? The world is full of good intentions but short of those who carry through to show themselves the real thing. In this case the real thing is a genuine Christian planted by God in His field. It is not my role, nor is it yours, to figure out who are tares and who are wheat. Let God do that. Perhaps the main reason this parable is here is to sound a warning to all of us who profess Christianity to examine ourselves to make sure we are in the true faith, following the teaching of Christ and building on a right foundation. Jesus likened those who heard His teachings and actually did them to one who built his house on a rock—to thereby withstand the winds and gales of life that seek to destroy and shipwreck faith (Matthew 7:24-27 Matthew 7:24-27 24 Therefore whoever hears these sayings of mine, and does them, I will liken him to a wise man, which built his house on a rock: 25 And the rain descended, and the floods came, and the winds blew, and beat on that house; and it fell not: for it was founded on a rock. 26 And every one that hears these sayings of mine, and does them not, shall be likened to a foolish man, which built his house on the sand: 27 And the rain descended, and the floods came, and the winds blew, and beat on that house; and it fell: and great was the fall of it. American King James Version×). In this parable Christ concludes by saying, “He who has ears to hear, let him hear.” It’s wise to hear the teaching and let it move us in godly fear to habits and a life that are sound and faithful. Sometimes it feels as if I am surrounded by weeds, with little wheat for nourishment. But then I think of this parable and it becomes a field of wheat, with the “tares” on the edges of the field. God blesses us according to our faith. Sometimes if it seems like God is ignoring us, think about this parable. Are we planting wheat or is it really poisonous weed? I asked jesus to give me strength and wisdom in my prayers when i am with my other religious friends in my daily life. I got answer by this message today. Thank you jesus for speaking with me through this message. Amen. This has been a topic on my mind for quite some time now. One of the best points is to let God sort out the field and to be kind to all. Am I a tare or a wheat? This is an important question we all need to ask ourselves. This parable is talking about the time just before the 1000 year reign of Chris.t The church was taken earlier at the rapture. This parable corresponds with Matthew 24 which also does not concern the church. You are on Jewish and Kingdom ground. These jews were taken to a bad place in the parable just like they were in Matthew 24. Indeed the Jewish nation in the end will be Gods Little Flock.